YAHOO... Shutting GEOCITIES Down ! Over the weekend, I heard the news that YAHOO is Shutting GEOCITIES Down. This is not great news for me- as I have 2 Free Geo-cities Sites and One That I pay for. All three will be removed by Yahoo - by the end of the year - unless I save and move them all to a new location. To be honest, I'm not real happy about this "surprise announcement"and I'm sure I'm not alone... as I know millions have geo-cities web-sites. It seems especially wrong - that I will be loosing the site that I am currently paying for, as well. I will do my very best to move all of this web-site - www.itsawonderfulmovie.com to a new server (it won't be Yahoo!) over the course of the summer and autumn. Until then, updates can be found here on my BLOG and on the Family TV Schedule page. Take care, everyone, and God Bless! Also makes a Great Gift for Mothers Day! The next one does, too! Hope you enjoy these DVD selections! Who needs to head to the theater when there are so many great selections already on TV for the entire family. You just need to check the FAMILY TV SCHEDULE and be sure to take note of any show that interests you and your family... and watch them together with a big bowl of POPCORN, of course! Also, it's great to record a show and fast forward through those commercials and pause when needed or fast-forward through anything you like or dislike! APRIL has given us lots of New TV Movies, including Love Takes Wing and Love Finds a Home. THey are the 7th and 8th Movies of the Love Comes Softly Series. Love Takes Wing will be released May 5, 2009 - on dvd. Click here for information. Check out upcoming MAY MOVIES, here - with more information on Movie Titles, Plots, Casts, and Pictures! Happy Easter - Sunday April 12th! Easter is a very special day for our family... we rejoice in the Resurrection of our Savior... and while we still believe in the Easter Bunny and hide/hunt eggs, this is what this day truly means to us... honoring Jesus, and his greatest gift and sacrifice for us - His life. I was very young when I first asked Jesus to come into my Heart and forgive me of my sins. As I've grown and matured throughout the life, I have learned that it is a daily walk... and the sweet hymns of old that I grew up with, such as Amazing Grace, What a Friend we have in Jesus, The Old Rugged Cross, etc... mean so much more to me today. It's just so sweet to see all the little Easter bunnies, chicks, and lambs... and all the little sweet goodies that fill Easter Baskets. I love all the little children dressed up in their finest on Easter Sunday Morning- with their Patten Shoes shined just for church! So adorable! Please be sure to visit the Family TV Schedule to see your favorite Easter Specials - including Easter Parade, Easter Promise, The Ten Commandments, and more! Doris Day is one of my absolute favorite Movie Actresses of all time and I just wanted to wish her a belated April 3rd ~ Happy Birthday! 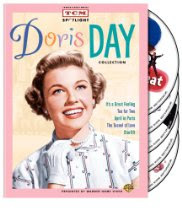 I love how TCM (Turner Classic Movies) honors stars on their Birthday and I was definitely glued to Doris Day and Jimmy Stewart (one of my favorite actors, by the way!) yesterday in The Man Who Knew too Much! What a wonderful movie that is.... its one of those ones I absolutely love watching over and over, again and again! Doris is also delightful in Move Over Darling and The Thrill of it all with the handsome, James Garner. I loved those two together. Their movies are rather fast-paced, witty, and intriguely fun! Doris, is the beautifully sweet girl-next-door type! I guess that's why she's so welled loved by many... for her endearing innocence and pure sweetness! God bless you, Doris, on your Birthday and Everyday! Thank you for your Precious Movies and Lovely Music!